Unishire has been into the real estate business since 1987. 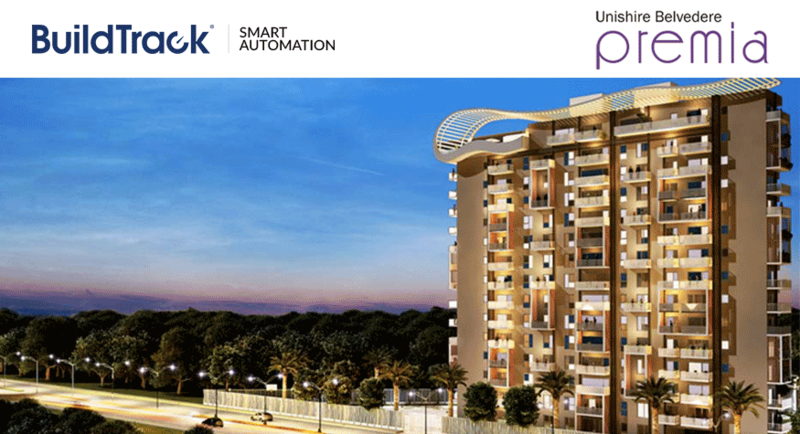 With the latest technologies setting in, Unishire has approached BuildTrack for the complete apartment automation solutions of their apartments in Bangalore. Unishire is a trusted name in the industryand provides highly standardized apartments in various configurations. BuildTrack is involved in two of its projects which are Unishire Terezza and Unishire Premia. Unishire Terezza is spread over 3 acres of land and across 4 towers. The project boasts of 14 storied high rise structures consisting of 183 apartments with a private terrace each. Apart from this it has a unique feature of Hanging Bedrooms for 12 connecting apartments which makes it one-of-a-kind. Unishire Premia, the second project which is inspired by German architecture consists of 68 apartments and is spread over 1.15 acres. This project focuses on penthouses with large space terraces. Both the properties have well planned structures, latest amenities, automation ready homes, etc. BuildTrack Home Automation System has suggested few products for their world class apartments. This includes Wi-Fi based Video Door Phone (VDP), Remotes for lighting control, Gas Sensors for detecting leakage of gas and Motion Sensors for energy conservation. Also the BuildTrack Smart App helps you monitor and control the entire apartment on a Smartphone or a Tablet.